Thermoplastic coated 6' rectangular picnic table with # 11 ga. punched steel top and seats for all weather durability and round corners for added safety. Mounted on 4" square pedestals for extra stability. 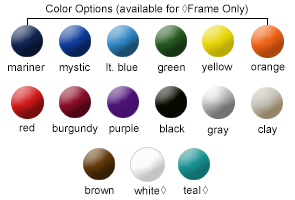 Available in the colors shown below in a lightly textured Polyethylene finish. All models are available in an in-ground or surface mount. ADA approved models are designed with one 24" overhanging side for universal access. 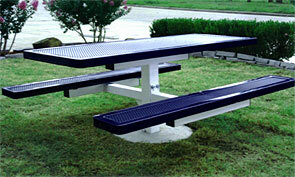 All wheelchair access rectangular picnic tables conform to latest ADA specifications.